I made this floral wedding cake myself and gifted it to our friends for their first marriage ceremony. I called it the love cake. Our friends were impressed by this cake and the specially set up, selected colours of the flowers, which represent happiness and warmness. I spent 12 working hours baking, filling and decorating to finish this cake. The cake was composed of three square levels. Each one of them was made of a different flavour (vanilla, chocolate and strawberry). It was filled with buttercream icing, covered in white ganache and topped with white Fondant. 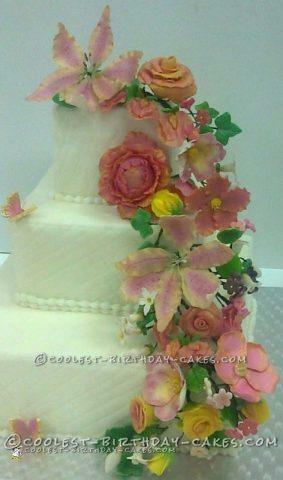 The roses were handmade with gumpaste. I used different degrees of pink colour for the flowers and then added others which were yellow, white, orange and violet. I also made different shapes of green leaves. The critical point of making this wedding cake was the time required for baking the three layers in a single home baking oven . I believe that my presented cake is wonderful and I’m so happy that I did it.